Jade (Crassula ovata, syn. Crassula argentea) is a gem of a plant that requires little care. It's a perennial in U.S. Department of Agriculture plant hardiness zones 10 through 11, but elsewhere it's grown as a houseplant. Jade has lots of green appeal because it is forgiving of poor soil, dry homes and infrequent watering. As a native of South Africa, jade prospers in warm environments. It performs best when daytime temperatures are between 65 and 75 degrees Fahrenheit and nighttime temperatures are between 50 and 55 degrees F. Because of its sensitivity to cold temperatures, move plants away from drafty windows in the winter. Jade is responsive to bright light, some sunlight and even shady locations, but it prefers four hours of direct sun daily if grown outside, and bright light in a south-facing window if grown indoors. In full-sun areas during hot summers, provide some afternoon shade. 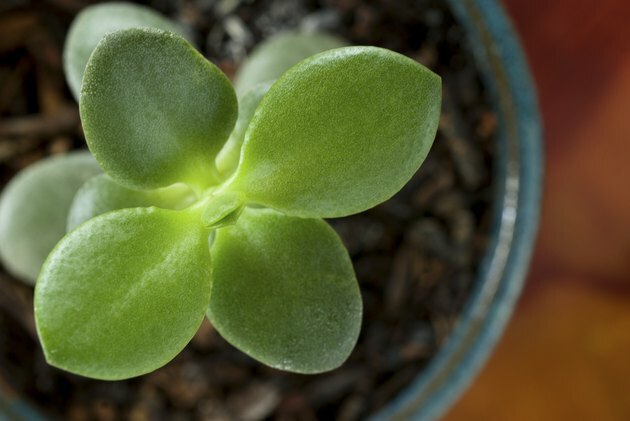 As a succulent, jade stores water in its fleshy leaves and stems, reducing its watering needs. It requires only a moderate amount of water and prefers soil that dries between waterings. Soggy soil causes jade's roots to rot, causing plant death. Conversely, too little water causes the leaves to spot or drop, and it can also lead to plant death. In the fall and winter, jade needs a resting period during which you can water it less frequently. Jade thrives in low humidity, so you do not have to mist it. Plant jade in a potting mix formulated for succulents that provides good drainage, typically a blend of peat moss, sand, and vermiculite or perlite. Jade plant is not a heavy feeder. Apply a liquid or water-soluble houseplant fertilizer such as 10-10-10 only once every three months. After you repot a jade plant, wait four months before fertilizing it. Typically, you mix 1/4 teaspoon of water-soluble fertilizer in a gallon of water, but follow specific label recommendations. Water garden plants until the soil is saturated but not soggy, and water container plants until the water runs out of the drainage holes. Jade plant is bothered by few pests. Mealybugs are occasionally bothersome, but you can easily remove them by dabbing them with cotton swabs soaked in alcohol. Don't use insecticidal soap because it may injure jade plant. Jade plant is not prone to disease, but it suffers root rot if you water it too much. Jade branches naturally and typically you don't have to prune it to shape it, but you can cut it back if it overgrows its bounds and it will branch out again. Disinfect pruning tools by soaking them for five minutes in a solution of three parts water and one part household pine-oil cleaner. Rinse pruners with water before making any cuts on the plant.